Looking forward to parking the bike at an open store, probably early next year. 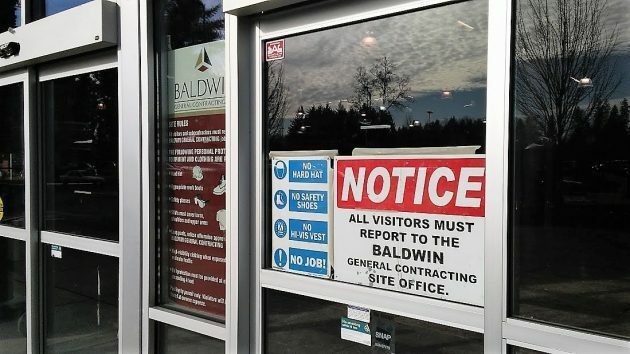 Another sign that things are moving ahead on the plans to open the new market at the North Albany Village shopping center: Baldwin General Contracting Inc. has begun working to rebuild the inside. 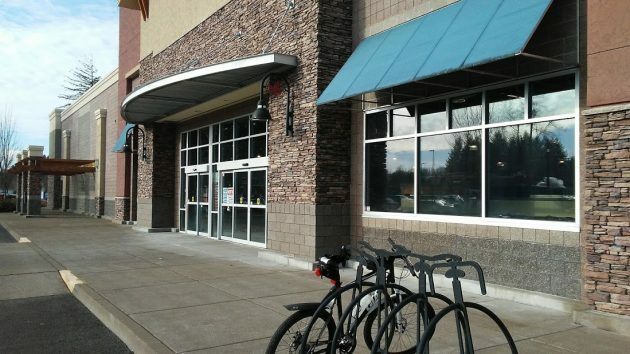 Judging by the frequent questions about this, North Albany residents have been getting impatient about the opening date ever since The Myers Group of Clinton, Wash., said last January it planned to reopen the former Ray’s space as a supermarket combined with an Ace hardware store. Work evidently has begun. Outside of the building a couple of days ago, there were trailers full of demolition debris. When I called the contracting company this morning, I was told the construction work would probably be finished around February. Signs of progress on the doors of the planned market in North Albany Village. I wonder if the planned garden center will be in direct competition with Tom’s Green Thumb just across Hickory in the old Foodtown building. Nice job, good info. Now tell us when the mess downtown will be done. Thank you. W/O Hasso we would not have any pertinent Albany information. SO TRUE……..I ALWAYS LOOK FORWARD TO HASSO’S GREAT INFORMATION! Yes! I was just thinking the same. Thank you Hasso, for all the information given, about our town and surrounding communities. Like your bike. Must be an echo in here. Yes, good job HH. …but if the new grocer has the same sticker shock/no reward prices of the last regime I’ll only be a once and awhile shopper. As for Tom’s Green Thumb I’ve never heard of him or it so no need to worry about some good old competition. Traffic? I am very ready to shop in our new grocery store. Yet, I wonder about the city’s plan for growth in the vicinity. The store and nursery (as well as proposed apartments in two nearby acreages) will create traffic challenges. Proposed traffic solutions? For example, I noticed that parking at the new stores showed parking spaces behind the store even I did not know existed (in my backyard). How will people know where to park? What is the overall city plan to route local traffic? Will you investigate what’s to happen on Hickory HH? Your reporting is awesome. For one hj.anony1, my friend Tom – Tom’s Garden Center – doesn’t hide behind a false name! He & wife Annette have worked for years to build up a very resourceful, useful, and great addition to the knowledge of flora & fauna of our area! Must not be a known under the rock you hide out under. Not that I wish the ACE group & garden competition any harm but we will take the extra time to “cross-over-the-bridge” to patronize Tom & have for years! The correct name helps every time.